My bullet journal has changed my life. No, really friend. My bullet journal has changed my life in so many positive ways! Now that' I’ve been a bullet-journalist for several years, I feel like I have insight to share! First thing, is figuring out if this system would be a good fit for you. I hope that what I’ll share with you will guide you in taking your first step. We’ve also collected many other resources down below for you to dive deeper into, if it is a good fit. We’ve selected some of our favorite resources for beginning a journal (video and blog posts) and, the supplies I’ve personally loved to use are linked down below. 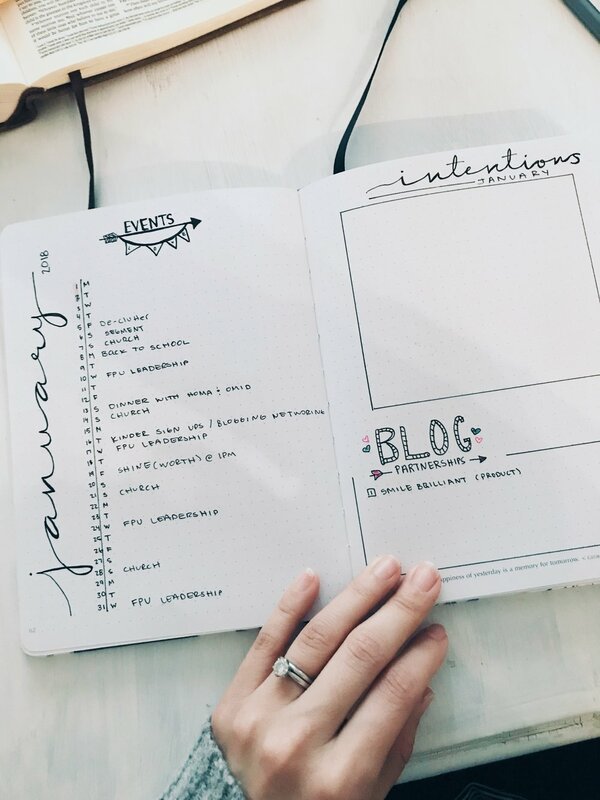 I hope you find that a bullet journal will provide you with an artistic and practical way to organize your life and give you that creative -therapeutic place where you can go when you need, as well as the support of blank pages that are less daunting than an already pre-set calendar. This is for the creative being who loves to add art to her everyday life. I believe if this is you, a bullet journal will help you flourish into the highest, most authentic version of yourself. One insight is to focus on discovery, and being okay being new to something- rather than performance! A downfall of many who want to do a bullet journal is being trapped by perfection. I can empathize with feeling scared to start my first pages. Don’t partner with the pressure for yours to look perfect, like a person who might have been doing one for years and years, and creating a stellar bullet journal of the gates. Give yourself the freedom to be like a little kid and just create without judgement. I feel like the number one gain from my years using this method of organization and artistic expression have been cultivating a more grace-filled relationship with myself, my art, and my failures! If you’re ever feeling overwhelmed with not following through on your dreams and goals and could use the accountability. If you’re feeling like you don’t have someone to confide in that you can trust. If you’re in a place where your creativity is the last priority but you know for your family’s sake you better find something to direct that artistic energy, Oh so help me, Rhonda! If you feel like you forget- A - LOT, where your brains are and you need to just make a list of groceries that you can find…five minutes after you’ve made it. If you feel like there is so much you could complain about, but you’d rather pour your attention and energy into starting a gratitude journal to help your brain focus on the good that is actually happening in our life. If you feel like you have terrible handwriting and you’d rather use pens to put your hair up. If you feel trapped by the illusion of perfectionism and you want a gentle way to “practice making mistakes” without beating yourself up. Than consider a bullet journal! My journal and I, have spent many hours together and it’s been delightful seeing how much I’ve gained in the process. I would love nothing more than to share my love for bullet journaling with YOU! It is something that covers personal organization and helps with focusing on gratitude. I can always start at the new page even if I’ve left my journal for a little while. I have the opportunity to practice patience, and have a place to go when I need to direct some creative artistic energy. I have a record of all my life, and have often cried going back to old journals and seeing my growth as a person! I’ve gained a better understanding of who I am. I do weekly spreads with a reflection section every week (I don’t always fill it out but I provide myself a space to reflect on my life) and it’s super helpful as I’m learning how to become my own best friend and cheerleader. It’s so fun, as well, when I go back and read my reflections from other months to see the prayers I’ve prayed, and the way God has been moving in my life. It’s been a great source of therapeutic opportunity that I was missing! You know, I did have many diaries in the past but for some reason I would start with the “Dear Diary, Billy Bob doesn’t like me”…. and then off it went to collect dust! I think that having ONE journal that aids in your organization, mental health, relationship with yourself, and gives you a space to be artistically creative OR not, is a great resource to have. The months that I’ve been super artistic are so nice to look back on. The months where life has been really difficult and I could barely get out of bed have also been marked in my journal as perhaps dry and desolate. But, I love that the next page is FRESH START. A fresh start to be exactly who I am in that moment with no judgment. How do you see bullet journaling helping you flourish in your life? If you’re looking for an explanation of what a bullet journal is and how to start it, here is a blog that is a great resource.